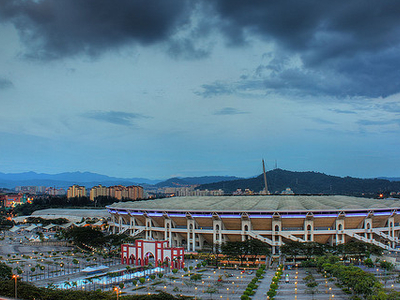 The National Sports Complex or Kompleks Sukan Negara in Malaysia is the largest sports complex in the country. It is located in Bukit Jalil, 20 km south of Kuala Lumpur. Described as the "sports complex in a park", it was the only one of its kind in the country or region when it was fully developed. It was officially inaugurated by the Prime Minister of Malaysia, Tun Dr. Mahathir bin Mohamad, on 1 January 1998 ahead of the 1998 Commonwealth Games in which it staged the Games' opening ceremony. Kompleks Sukan Negara is easily accessed via Shah Alam Expressway, Puchong-Sungai Besi Highway, Maju Expressway and Kuala Lumpur-Seremban Expressway. It is also served by a rapid transit station. 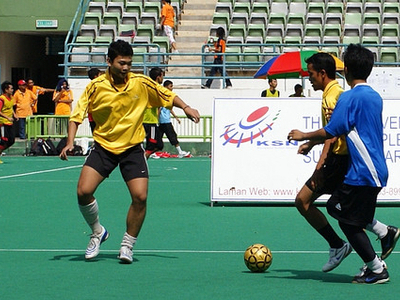 Here's the our members favorite photos of "Sporting Areas in Kuala Lumpur". Upload your photo of National Sports Complex!